Please do not combine James Madison's entry with those of others such as Alexander Hamilton and John Jay, although they were co-authors of the Federalist Papers and other documents. The historian Garry Wills, one of President Madison's biographers, says, "Madison's claim on our admiration does not rest on a perfect consistency, any more than it rests on his presidency. He has other virtues. . . As a framer and defender of the Constitution he had no peer. . . The finest part of Madison's performance as president was his concern for the preserving of the Constitution. . . No man could do everything for the country – not even Washington. Madison did more than most, and did some things better than any. That was quite enough." James Madison has a Legacy Library. Legacy libraries are the personal libraries of famous readers, entered by LibraryThing members from the Legacy Libraries group. James Madison's book The War of 1812 was available from LibraryThing Early Reviewers. James Madison is currently considered a "single author." If one or more works are by a distinct, homonymous authors, go ahead and split the author. 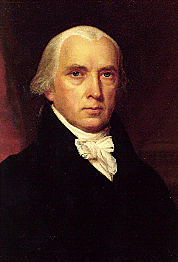 James Madison is composed of 4 names. You can examine and separate out names.